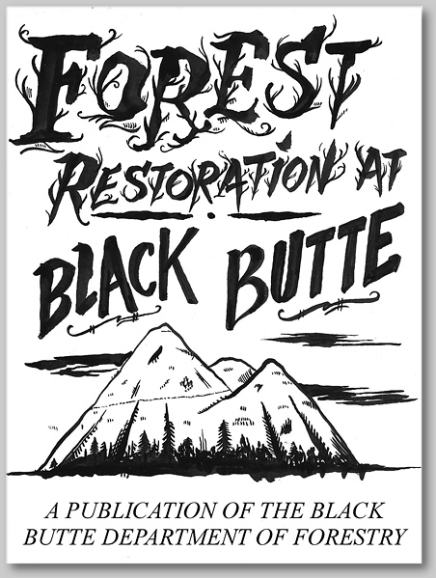 One of more ambitious projects we have taken on at Black Butte is natural forest restoration. Beyond the six-acre "compound" where the BBCRC is based, we are stewards of another 44 acres of adjacent forest and wetlands areas. While this land includes some areas of relatively diverse forest, over half of the land was turned into a Ponderosa Pine tree plantation in the early 1970s (see our Land History page for more info on the history of the forests in this area). Over time, we are working to transform these areas so that they are restored to a more biodiverse forest that better supports a variety of plant and animal life, is more aesthetically appealing and is better able to cope with wildfires. In 2013 we completed a short documentary film about our forest restoration efforts. We have benefited from considerable assistance with these efforts. 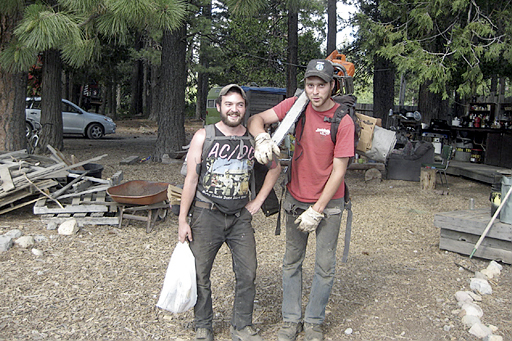 First and foremost is our forest restoration team, the "Black Butte Loggerman's Association", a group of friends who are also forestry specialists and professionals as well as others who have "learned on the job" at Black Butte. Our team is good at what they do and they really care about the land! Thanks to Brody, Chris, Kris, Cody, Carson, Moss, Kevin, and the many others who have helped out for shorter periods and as occasional volunteers with this work! We have also been the recipients of several grants/financial assistance programs to help with our forest restoration work. In 2013-15 we had funding from the Environmental Quality Incentives Program of the Natural Resource Conservation Service/US Dept. of Agriculture (EQIP/NRCS). This allowed us to carry out a lot of initial brush clearance, thinning, and fuels reduction. NRCS also supported the preparation of a Cooperative Forestry Management Plan (CFMP) which was completed in 2016 with the assistance of registered professional forester Mike Hupp. This was followed by a grant approved in late 2016 under the California Forestry Improvement Program (CFIP) of CalFire for tree pruning and thinning and further fuels reduction. These efforts have combined to put us well on our way towards having a healthier and more fire-resilient forest at Black Butte. The concept of plantation forestry has been harmful to natural forests and biodiversity in California and many other places. And as the plantation model spreads to the developing world, it is negatively impacting much of the planet. In developing countries the spread of plantations has been accompanied by "land grabbing" in which large companies manage to take over/privatize forests that have been the traditional livelihood base of many indigenous and other forest-dependent communities. Mono-crop plantations favor one species, in our case a fast-growing conifer, at the expense of all others. Even a well managed mono-crop plantation offers a very limited variety of food and other resources for birds, other wildlife — and people (for instance, wild mushrooms are much less likely to be found in abundance in plantations as opposed to natural forest areas). In fact, in many ways plantations are not really forests at all, being more akin to agricultural croplands than they are to natural forests. At Black Butte many of our plantation areas were created through the now-discredited (even within the forest plantation industry) approach of planting narrow rows of pine seedling in straight geometric lines. The intention was that they would be thinned out over time and then, when the remaining trees reached a certain size, clear cut once again. However, due to land ownership changes in the 1980s, our plantation forest areas were ignored and never properly managed or thinned out. This created an unhealthy and dangerous situation. Too many trees all of one species all too close together, competing for limited water resources (which can stress them, increasing their vulnerability to disease) and with an understory "dead zone" of dead or dying brush and bare limbs. These areas lack a natural look, have limited biodiversity and are dangerous due to the extremely high fuel load this dead wood represents. All that dead brush and those dead limbs can result in "ladder fires" in which a fire on the ground climbs up a series of dead limbs into the forest canopy. While fires have traditionally been an important part of the cycles of natural forest generation, a fire in this artificially human-created situation could easily rage out of control and be catastrophic — much more damaging to the forest and wildlife than would have been a natural periodic fire in which many larger trees would normally have a good chance of survival. A second problem is the legacy of having had six acres of our land ("the compound") formerly used to park hundreds of cars when an auto-dismantling company was here. Much of the topsoil was scraped off, gravel was added in some areas and the soil became compacted. Our work at Black Butte to address this problem involves a number of steps and strategies. This work is very labor-intensive, particularly as many areas do not have vehicle access and we don't want to construct new roads all over the land. This is why we have needed — and continue to need — a lot of volunteer help (in addition to a limited amount of professional forest restoration assistance) in accomplishing our goals of transforming our plantation areas back into more natural forest. First we need to reduce the load of dead wood on and around the trees. This involves "limbing up" the trees through sawing off all the dead limbs from the ground up to a level of around seven to eight feet. This can be done using hand saws or chain saws, each have their advantages. In doing this we try to avoid taking off any low limbs that are still alive (those with green needles). At the same time we also are removing much of the dead brush (mostly Antelope Brush and Manzanita) that has died due to shading and water competition from the pines. In general we leave shrubs in if they are still alive, especially the Manzanita which provides nice visual interest and helps to break up the look of the rows. Limbing up trees and removing dead brush is something we need a lot of help with from BBCRC volunteers. Getting rid of all of this dead material is challenging. We do this in two ways. In areas that are not too far from where we have vehicle access, we can carry/drag the limbs and brush to accessible areas. Then it is put in large piles to be chipped up. This involves the use of a large industrial wood chipper on a contract basis. So it is expensive. However, in some areas, particularly on our heavily impacted compound, all of those woodchips that are created have the added benefit of helping to restore and improve the soil. Chipping facilitates the rapid composting of the wood back into the land. Our goal is to transport as much dead brush onto the compound for chipping as is feasible given the limits of our resources. Some areas are just too far away from the main compound (or other places a truck with a large chipper can access). In these areas we are creating "burn bays" (small clearings) where, on calm wet winter days, we burn these materials. This burning process is also labor intensive and is something with which we can use a lot of help. However, it must always be done under the supervision of someone who really knows what she or he is doing and on the limited number of days in the year when the forest and weather conditions are right — that is, cool days when there have been sufficient rains to provide a thorough soaking to the land but when it is also calm, with little or no wind. Once we reduce the fuel load, it is a lot easier to get around and to see what we need to do in terms of thinning out the pine trees. Thinning out trees is an ongoing process and will be for some time. In part, we are still trying to figure out what is our ideal overall density of existing Ponderosas. This involves some balancing of our goals as we also want to retain a certain amount of screening that promotes a sense of remoteness and solitude/privacy in certain areas. In some areas we haven't wanted to open things up too much, especially before the understory and other trees have had an opportunity to grow and fill in. One objective in thinning is to reduce the overall density of the pines so that the remaining trees have enough sun, space and water to grow well. This also reduces their stress due to competition for water (which can make them more vulnerable to disease). However, another objective is to begin to restore a more natural look to the forest — recreating an ambiance more resembling the random beauty of nature rather than the obvious hand of humans. So, instead of just, say, removing every other tree in a row, we are trying a variety of approaches. One is to keep some areas of relatively high density — groves or clusters of groups of trees. This allows us to keep some nice shady and denser areas. At the same time we are creating small clearings (some through the creation of areas for the burn bays). Also, even in the plantation areas there are some other trees — mainly Incense Cedars but also White Firs, Douglas Firs, Black Oaks, Junipers and, especially closer to the creek/wetlands, a variety of other species including Black Cottonwoods, Water Birch and a variety of willow species. Due to their relative rarity, we avoid cutting down any non-Ponderosa trees and, in fact, we often try to thin out the pines in ways that promote the growth of existing trees of other species. Another technique is to create snags — standing dead trees. This is done by girdling a tree near its base. Snags provide important habitat for woodpeckers and other birds that nest in holes in trees — as well as for insects that provide food for the birds. We also want to retain a mixture of tree sizes. This is sometimes challenging as many of the trees on our land were planted at the same time. We also like to keep "oddball" trees — those that managed to grow up in between the rows, out of line with other trees or that have unusual interesting shapes or structures. This differs from a conventional forestry management approach that would stress the selection of larger standard looking trees with good prospects for quick growth in order to maximize timber yields. Trees selected for cutting are then marked and cut down. Most are then bucked up to be used for firewood for the BBCRC and volunteers who have helped with the process. Getting these logs from our back areas out to the compound is another labor-intensive process. We often leave the logs out over the summer so they can dry out (and lose weight) before we bring them to the compound. On some larger trees we have used an Alaska mill (a chain saw mill) to produce our own rough-cut lumber for use in projects on our land. Some trees that are felled are left in place to slowly decompose on the forest floor. This provides more good habitat for various organisms — insects, worms, lizards, rodents, etc. — helping to promote a healthier more diverse forest. The felling of trees selected for thinning creates another round of debris (needles, smaller branches) that also needs to be dealt with by chipping or burning. The thinning process, which allows more sunshine to reach the forest floor (and in places where we have had burns, the removal of some of the thick pine needle mat), creates the conditions that naturally facilitate the growth of understory plants. We have started to see this process in some places and expect much more of this to occur in the coming years. However, this can be a slow process, in part due to the thick mat of pine needles created over many years that inhibits other trees and plants from getting started. So in some places we are now starting to try to help this restoration process along through planting other native shrubs and trees. When doing this we try to think about what we want to forest to look like five or ten or twenty years from now. One aspect is to try to plant new trees in between the old rows of plantation pines. Some of the main species we are using for this are Incense Cedar, White Fir, Douglas Fir, and Sugar Pine — common native species to this area. In the wetter areas we are experimenting with planting Pacific Dogwood, Quaking Aspen, Mountain Ash, and Big Leaf Maple — species that are common nearby but of which not so many examples can be found on our land at present. We are also looking at understory plants like Oregon Grape and other shrubs as well as trying to figure out how to reintroduce and promote the growth of understory wildflowers. In sunny open areas (including on our compound) we are also planting Black Oak and the rare but native Modoc (or Siskiyou or Baker) Cypress. In a defined area of our main compound we are also planting a select number of other rare or endangered species, mostly conifers. These are not all native to our immediate area but are non-invasive and add to the variety of plant life in the immediate vicinity of the area where most visitors to our land are. The vision is that this area will over time become sort of a "mini-arboretum" that helps preserve some rare species and provides a lot of visual interest for visitors. 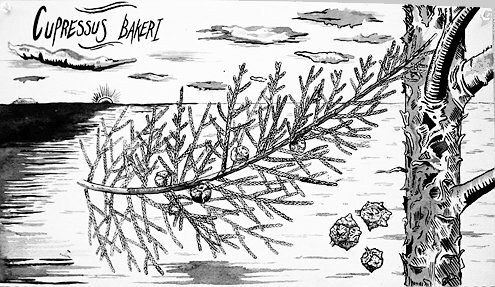 One especially interesting local species we have been planting in open areas of our compound is the threatened Modoc Cypress (Cypressus bakeri), also known as Baker Cypress or Siskiyou Cypress. This is a native tree to our region but is extremely rare, growing in only 11 locations in the world. Five of these locations are in Siskiyou County. So far, these seedlings are doing well in sunny dry locations on our compound. Our seedlings have come from a number of sources — one of our members propagates many seedlings on his own. We have also received other donations and purchased seedlings at a nearby native plant nursery and have tried digging up and transplanting small seedlings from the land of friends in the area. Ensuring that seedlings we plant survive is another challenge. Our weather is characterized by wet cool winters and warm dry summers. So we have to carefully plan out when to plant. Many people's thoughts turn to planting gardens — and trees — in Spring. But if we wait too long (the start of our dry season is in May) seedlings will have a really hard time getting established before they get sufficient rains. So planting in the early Spring (March) or in the Fall is often a better choice. Still, many of our new plantings still can really use an extra assist through watering them on a periodic basis. This is mainly realistic on and close to our compound where we have hoses connected to our water system. Keeping newly planted trees adequately watered is yet another challenge and one with which we often ask volunteers to help out. A related aspect of the above forest restoration initiative is the identification and removal, to the extent that is practical, of invasive non-native species. This involves a number of challenges and could be the subject of another entire paper. Our forest restoration project is an experiment where we are learning by doing. Sometimes it is hard to know for sure which plants will do well here on our land. This is due in part to the incredibly diverse micro-climates that exist in this area of Siskiyou County. 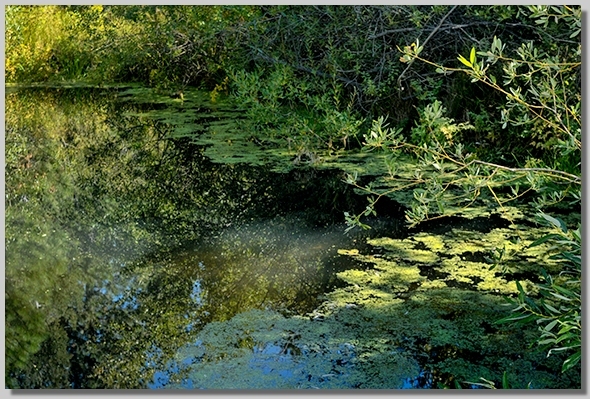 We sit near the edge of two very different ecosystems — one a relatively open semi-arid place dominated by juniper, sage, and similar plants and another that is much wetter with a very different and much denser mixture of trees and other plant life. Elevation and where exactly we sit in relation to Mt. Shasta, Black Butte, and the Klamath Mountains, dominated by nearby Mt. Eddy, all factor in to a very specific climate at our site. Not to mention the many differences in the volcanic soil mixtures here on the flank of Mt. Shasta. But we try to understand the ecology of this area as best we can so we can formulate a vision of what a healthy forest ecosystem in this area should look like, and we go from there, seeing what works and what doesn't, and adapting what we are doing accordingly. While we have accomplished a lot towards making our forest healthier over the last few years, there is still much to be done — in many ways we are just getting started. The project would have seemed overwhelming except for the number of people who have stepped forward to help out — some for a few hours, others for months. In 2012 and beyond we are hoping to step up our efforts. This will require ongoing assistance from our friends and supporters. In the long-term we hope that the forest restoration work we do at Black Butte will not only impact our relatively small area of forest but also be an inspiration to others — landowners, non-profits and other forest managers — seeking to restore some of the many thousands of acres of forests in our area that have been either mismanaged or managed solely to maximize timber production at the expense of biodiversity and long-term sustainability. Most of the trees we are planting at Black Butte are of species that are native to the immediate area. Some were already present on our land or in adjacent areas. Others may have once grown on this land but were lost due to logging and the land's conversion to a mono-culture pine tree plantation. These include Douglas Fir (Pseudtsuga menziesi), White Fir (Abies concolor), Incense Cedar (Calocedrus decurrens), Sugar Pine (Pinus lambertiana), Black Oak (Quercus kelloggii), Mountain Dogwood (Cornus nuttallii), Shasta Red Fir (Abies magnifica var. shastensis), Western White Pine (Pinus monticola), Lodgepole Pine (Pinus contorta), and Quaking Aspen (Populus tremuloides).